George Canning was born in London on 11th April, 1770. George's father died when he was one year old leaving the family in poor financial circumstances. George was helped by his mother's brother, who paid for him to be educated at Eton College. A star pupil, George went to Christ Church, Oxford before becoming a lawyer in 1790. 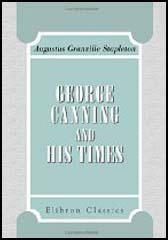 George Canning's uncle, a reformer, arranged for him to meet leading Whig politicians such as Charles Fox. 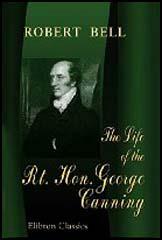 After a period under the influence of Fox, George Canning met the Tory, William Pitt. The two men became friends and in 1793 Pitt helped Canning become MP for the rotten borough of Newtown in the House of Commons. In 1796 William Pitt appointed Canning as secretary of state for Foreign Affairs. This was the first of a series of posts held under Pitt that included: commissioner of the board of control (1799-1800), paymaster-general (1800-1801) and treasurer of the navy (1801). After Pitt resigned in 1801, Canning joined the opposition to Henry Addington's government. Over the next few years Henry Addington suffered from Canning's parliamentary attacks. Canning was especially critical of Addington's refusal to accept Catholic Emancipation. In May 1804 William Pitt returned to power and Canning was once again given the post of treasurer of the navy. After Pitt's death in 1806, Canning became foreign minister in the Duke of Portland's government. Canning played an important role in planning the war against France. It was Canning's idea to seize the Danish Fleet. This severely weakened Napoleon's forces and was a a contributing factor to his eventually defeat. Canning promised to send more troops to the Duke of Wellington who was fighting in Portugal. Canning was furious when he discovered that the secretary of war, Lord Castlereagh, sent the troops to Holland instead. A bitter argument took place and eventually Castlereagh challenged Canning to a duel on Putney Heath on 21st September, 1809. The two men missed with their first shots but eventually Castlereagh wounded Canning in the thigh. Canning left government and for the next few years Canning concentrated on writing. He contributed to the Anti-Jacobin Review and with Sir Water Scott helped to establish the Quarterly Review. Canning contributed several articles on political subjects including the need for full political and religious rights for Catholics. However, Canning was a strong opponent of any increase in the number of people who could vote in parliamentary elections. In 1812 Canning became MP for Liverpool. Canning was invited by the new prime minister, Lord Liverpool, to become foreign minister. Canning refused office because he was unwilling to serve in the same government as Lord Castlereagh. Liverpool approached Canning on several occasions to join his government and eventually he changed his mind and in 1816 became president of the board of control. After Castlereagh committed suicide in 1822, Canning replaced him as foreign minister. 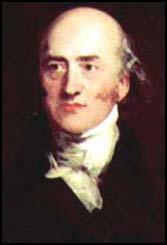 George Canning held the post of foreign minister for the next five years. When Lord Liverpool resigned in 1827 King George IV interviewed Robert Peel, the Duke of Wellington and George Canning for the post of prime minister. When the king appointed Canning, Wellington, Peel and several other leading Tories resigned from the government. Canning was forced to rely on the support of the Whigs to hold on to power. Those Whigs who accepted government posts had to promise not to raise the issue of parliamentary reform. Canning first concern was to tackle the problem of the Corn Laws. On 1st March, 1827, Canning introduced the proposal that foreign wheat should be admitted at a 20s. duty when the price had fallen to 60s. This new sliding scale enabled the duty to fall as the price rose, and to rise as the price fell. The Duke of Wellington led the fight against this measure and although passed by the House of Commons, it was defeated in the House of Lords. Even before being appointed prime minister, George Canning's health was in decline. The strain of office made matters worse and on 29th July he informed George IV that he was seriously ill. Canning was taken to the home of the Duke of Devonshire and on 8th August, 1827, he died in the same room in which, twenty-one years before, his first political influence, Charles Fox, had passed away.